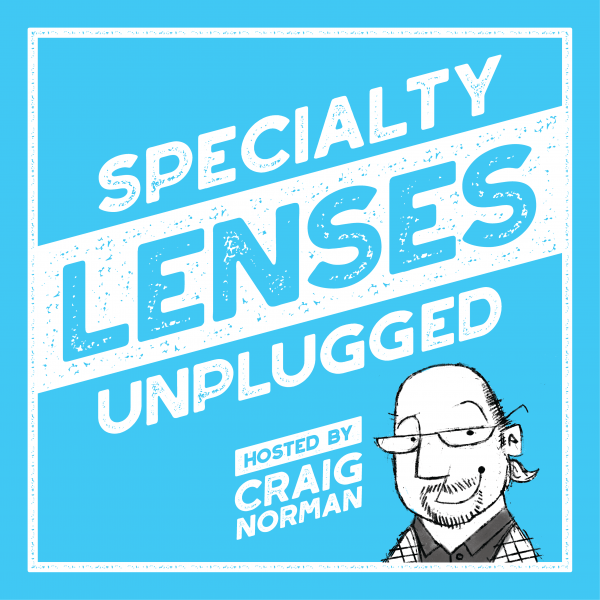 In December of 2018, Contamac launched the first season of Specialty Lenses Unplugged, a new podcast series hosted by industry veteran Craig Norman. In each episode, Craig sits down with expert guests for informative, lively discussions on how they became interested in contact lenses and their thoughts on key contact lens topics. Today, we are excited to turn the tables a bit and sit down with Craig as our guest to talk about his path into specialty contact lenses and the inspiration behind the podcast series. One of the first traditions that you created on the podcast was to first ask your guests how they got started in optometry and what led them to specialty lenses, so let’s start there as well. Can you tell us about the path that led you to where you are today? My story is a little bit different than the traditional path in eyecare. I was in the military, and after returning from Vietnam I used the GI bill to go to school. I first went to be an optician, but I didn’t really like that, then went back to school at the University of Minnesota in the Physician Assistant of Ophthalmology program which was a fairly uncommon program, even at the time. The class only had like 20 or so students (one of whom was Pat Caroline), but it was a popular, very competitive program to get into. As part of the training, I spent a year in an externship, and I was lucky to do that in Ohio at the Cleveland Clinic. I was really very fortunate to be able to work with some of the early contact lens studies, like the original extended wear study, where I found out that there might potentially be a place for me in contact lenses. I ultimately left there and joined an ophthalmology group in a large multispecialty clinic to start up a contact lens department. This is all at a time when optometry and ophthalmology really didn’t practice together so they used technical people like me to play roles that today would traditionally be done by optometry. It’s a very unique path, and it gave you the opportunity to really specialize in contact lenses. Can you tell us more about what you did later in your career? When I joined the multi-specialty clinic in South Bend, Indiana I was fortunate that the people that I worked for would let me do a number of things. Besides working at the clinic, I did quite a bit of consulting for industry, and I also did quite a bit of lecturing at state, national, and international meetings. I also started a contact lens lab and quickly realized that I couldn’t juggle all the things I was working on, so I ended up selling that to a group in Ohio. That background has been very beneficial because now I know a little about what is happening on the lab end and was able to, through consulting with the industry, understand what was going on relative to lens materials and the early days of GP materials and lens designs. And with the lecturing, I was able to meet people from across the globe and share ideas with them on how we can make these little widgets better. You mentioned that you have done a lot of lecturing all around the world, but you also helped start a meeting, correct? Yes. Around 2002 Ortho-K was just getting on the radar with some approvals that were occurring or were about to occur, and I had this wild-brained idea that we could have an international orthokeratology meeting. Along with Pentavision, we were able to actually pull that meeting off. Even the first meeting had about 350 people from around 20 countries or so. As my wife Ursula likes to say, I was crazy enough not only to start a meeting but to invite the world to come to it. We were lucky that industry embraced it a lot, and ultimately it morphed into the Global Specialty Lens Symposium, which now encompasses everything related to specialty lenses. It was gratifying to see what it has become, and satisfying to see other meetings around the world use that formula and be successful. With lecturing and your involvement with GSLS, you have been very involved in education for most of your career. Tell us where the idea to take the specialty lens conversation into the podcast arena came from? Around 18 months ago I decided I was going to give up my leadership role with the GSLS to do other things. I started thinking about what was next, and originally, I had this hairbrained idea that I wanted to start an eyecare online radio station where there would be 25 hours a week live, but it would run 24/7 and rotate through those programs. There is the technology to make that happen, but I just couldn’t figure out how to make that work at this stage of my career. Then very fortuitously, Marty Dalsing from Contamac reached out and asked if I had any interest in developing a podcast, which fit in so naturally with what I wanted to accomplish anyway, so I jumped at the chance to do it. There were eight episodes in this first season, and each had a different topic. Tell us a little bit more about how you decided on the topics and what you wanted to explore with these first episodes? We knew collectively that we weren’t going to jump in headfirst and have a weekly ongoing podcast and instead employ the philosophy of having a series or a season much like other media today. There would be an X number of episodes to start with that were loosely connected by one idea, the things you consider when incorporating specialty lenses into your practice. And that became discussions on scleral lenses, and presbyopia, and custom soft lenses, topography, and practice management. We were even able to include a visit to Contamac headquarters to talk to management and get an idea of what was happening from a material development side. We had a great cadre of speakers to begin with, names that we think everybody recognized. Like Drs. Barnett and Sonsino speaking about sclerals, Dr. Brooke Messer on presbyopia, Randy Kojima was our topography expert, Drs. Jason Miller and Dr. Steph Woo helped us out with practice management, and our friend Eef van der Worp from Holland and Dr. Matt Lampa spoke on custom soft lenses. And of course, I was able to interview Rob McGregor, Tristan Tapper and Martin Conway from Contamac and then wrap up the season with to how to actually position yourself to be a specialty lens fitter and the steps that take you on that path. You hit a lot of topics that we are very interested in and we hope the listeners find them to be as well. But there are certainly a lot more things we can cover, are there any topics that you are interested in delving into? One thing I would like to delve into is the measurement aspect of the anterior segment of the eye. We talked about topography, but we didn’t talk too much about what to do to extend that measurement outside of the limbus, looking at the profilometry instruments in the future or OCT in more depth. I think it is vitally important to have more discussions on that topic. Another topic is the area of corneal reshaping and myopia management, and the combination of those two. We touched on those topics a little, but I think there are some in-depth discussions that should take place on both of those fronts. Personally, I am very interested in OrthoK, as you can imagine from the original entry into putting on meetings with the Global Orthokeratology Symposium. And then presbyopia, which has been my personal challenge throughout my career, is something I am interested in getting into a more in-depth discussion about that area. It remains a challenge, we still need some work and there is this subcategory that we are just entering into that is made up of the use of decentered optics and EDOF, or extended depth of focus, that I think should be explored a little more also. And finally, another area that needs to be looked at is what is this environment on the ocular surface. We are learning a lot from the dry eye folks and the TFOS to really try and break down not only what is going on with tears and dry eye but also what is happening in the interaction with contact lenses. And that is really of interest, as the contact lens lives in that environment of tears and particularly the components of tears and how they interact with the surface of the lens is really a big deal. Another tradition we have on the podcast is to ask our guests to share something about themselves that most people probably don’t know, so tell us something interesting about you. I thought at some time during this first season that someone was going to pose the question back to me but it never did come, until now. The one I think I want to share most is that I grew up in a small town in northern Minnesota, and as a young man my first job was hauling furniture and appliances for a company called Zimmerman Electric. As it turns out, the fellow that I worked for was the father of Bob Dylan. I didn’t realize at the time what a big deal that was, as I was 16 years old I had my own issues to worry about. But I did know the Zimmerman family, who lived five blocks down the street from me, and although Bob Dylan was older than me and I didn’t really know him, I knew his brother David. And as I got older, I realized what a kick it was. Thank you, Craig for sitting down with us, you have done a fantastic job with the first season of Specialty Lenses Unplugged. To listen to the first eight episodes, visit the Contact Lens Spectrum website or search Soundcloud, Apple Podcasts, or Googleplay.